I am here representing [Two Suns] SHAMSAAN: a project and a calendar, a long term vision and an immediate contribution. I hope you will get to know more about [Two Suns] SHAMSAAN during the course of 2017. I hope that each of you will leave with a calendar and that you will read the children’s stories, see their drawings and relate to them in their photographs. The children’s photographs are amazing. They show beauty, joy, determination, yet every one of the children has been through immense trauma. Why am I representing [Two Suns] SHAMSAAN? I am an architect and a lecturer. It so happens that I was the General Reporter, i.e. Head of the Scientific Committee, for UIA 2014 Durban – a major architectural event hosted every three years by the International Union of Architects. Nadia Meer was our artist for the event. During the three congress days, she enlisted people from the 4500 delegates to make art, which she then put into a large installation on the final day. 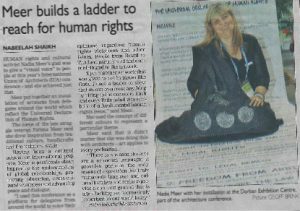 The theme of the art project was Human Rights. (See the articles featured in The Sunday Tribune 10th August, 2014 and The Witness, 6th August 2014). 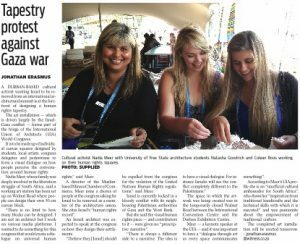 The first time I met Nadia, I was fascinated by the fact that she spoke about nothing BUT Palestine. She is now a close friend and I have learnt that Palestine is her life’s work. When she shared the idea for the Palestinian Children’s Artwork it seemed a complex and far-fetched idea. But Nadia has a way of “making things happen”. She also has a habit of “building bridges”. Because of Nadia, I have been “dragged” to events, seated in the front row (always the front row!) and encouraged to communicate with groups and people I would generally not be involved with; my life has been enriched because of that! The process of selecting the children, interviewing them, gathering their artworks, compiling the stories and authentically representing them needed incredible dedication and persistence. Like all successful projects, it needed a team to realise it. I acknowledge the children, their families, the photographers, designers and AWQAF for seeing the value of the project and supporting it. However, like all successful projects, it needed a champion and driving force behind it, and that driving force was Nadia. The name SHASMAAN means Two Suns in arabic and comes from one of the children’s drawings. Please read the story of Ahmed Dwabsha. [Two Suns] SHAMSAAN represents an ideal, multiple views and inspiration for 2017. We woke up today to terrible stories of terror from around the world. We need inspiration wherever we can find it. I select one child to speak about: Mohammed’s village was destroyed and he lives in a tent. He designed an ideal school. I thought he would want to be an ARCHITECT when he grows up. However, Mohammed unexpectedly says that he wants to be a TRANSLATOR, using language to tell the world about Palestine and Palestinians; he wants to be a DOCTOR, to heal his people; he wants to work in MEDIA. I ask, is it really a language or communication problem that prevents the world from “seeing” Palestine? I salute [Two Suns] SHASMAAN for the effort to use art, photography and personal stories to bring light to what is unseen, and voice to the unheard. Indeed, [Two Suns] SHASMAAN is to be celebrated.